Viveks is a reputed chain of consumer durable goods in South India- Tamil Nadu to be precise. Vivek's was started in 1965 by B A Lakshminarayana Setty with a capital of Rs 10000, selling electrical goods and chairs. The name Viveks is inspired by Swami Vivekananda. From a small store in Chennai's Mylapore back then, today Viveks group has a revenue of 500 Crores annually, from 50+ stores in TN and Karnataka. This phenomenal growth has happened organically over time, with internal accruals and occasional bank loans and with regular profits, unlike today's startups which expand rapidly burning investor's money and running on a flawed model where profits are ignored in favor of valuations. Viveks' is currently running a mega discount sale,called Viveks Giant Warehouse Sale, where customers can walk into Vivek's large warehouse in Manapakkam and pickup goods at a much larger discount. Myself and a dozen other bloggers and influencers from Chennai were invited to be part of this event and we got a chance to interact with the top management of Viveks. 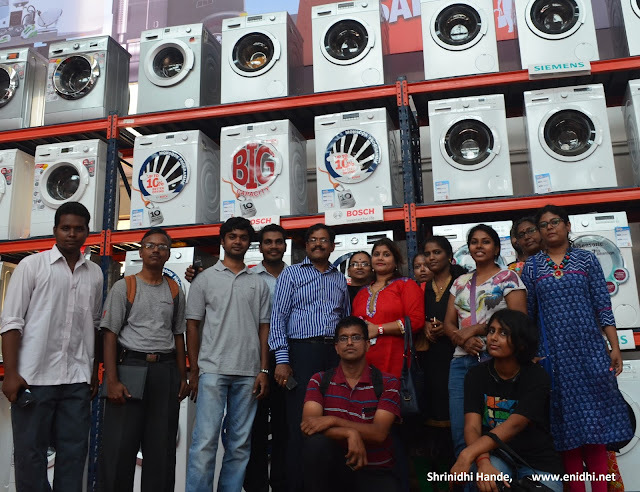 While primary objective was to get visibility for the giant warehouse sale, we got an opportunity to ask questions to Vivek's management and learn lots of valuable insights about the consumer goods and retail business. Q1: How was your growth funded? Do you have external investors? Q2: How is online e-tailers affecting your business? Do you have customers demanding that you match online rates? A: Yes, they (online) are affecting the business. Online shopping is convenient, 24x7 and cheaper, so yes, it affects offline stores. However, their model is fundamentally flawed- a huge part of funding is used to discount the items to be sold below cost price for a loss, in the name of customer acquisition- this model can't go on forever and certainly we can't operate like that. We (physical stores) offer better touch and feel, personal attention to customer's need and can ensure better overall experience than online. We do get smartphone trotting customers who expect us to match online rates, we often try to explain why we can't sell at that rate. We are able to give value to our customers and survive and grow. Viveks does have a presence on online market place and is selling online as well. Srinivasan joked that he can probably put up his goods for sale on e-commerce sites and buy back at much lower price! Q3: Branded retail stores like yours have high overhead, thus higher rates. There're many small scale mom and pop shops selling consumer goods for a lower price than branded chains. Should you not be able to match their rates because you buy in larger volumes? A: I hope you have compared exact model. Yes, small shops have less overhead and occasionally they might be able to sell for lower at times, probably because they have to meet some immediate payment needs to banks/suppliers etc and out of compulsion might sell for less profit or no profit if you can pay in cash instantly. We will not be able operate like that. While most electronic goods are plug and play, few like Air Conditioner, Washing machine need additional plumbing/carpentry or other maintenance activity. It is very difficult to get hold of a reliable carpenter/electrician/plumber these days and get some coordinated quality work done from them. Vivek home serve unit brings various maintenance services required to run a house- plumbing, carpenter etc under one roof and gives our customers a reliable and quality service when our customers need it. Q6: Are these flood affected goods? A: No. We were indeed affected by floods. But we had insurance cover, so we could recover the loss- the process is still on. We had proposals that we sell flood affected goods for a discount, but such a sale could have compromised the trust bestowed in our brand, so we opted out of it. All goods sold now are fresh stock. Q7: Do we get same kind of delivery, warranty and other services like in regular store when we buy at warehouse sale? What is delivery time? Yes, all goods bought at warehouse sale gets free delivery, installation etc as one would get in store. Usually we deliver 95%+ orders within 24 hours, only a small % might take few more days depending on stock, delivery location and other aspects. Every night a dedicated team works to sort out the orders received that day and their delivery to different parts of the city. After a round of Q&A we went on a walking tour of the warehouse where we could see the sale in action. Warehouse is a huge area and showcases over a lakh units from 1000+ brands and 100 + models/items under each category/brand. No individual showroom will be able to showcase this much options and consumers can see most versatile range and options to chose from. We next moved to neighboring warehouse, each one the size of an aircraft hanger. Here washing machines and refrigerators were on display. We took a group photo here. Srinivasan also explained how consumer sentiments have changed- earlier buying on loan/credit was an event of shame- customers felt ashamed if a post card reminding of payment due or a collection guys cycle is to be spotted near their homes. Today buying on credit has become a norm- if one doesn't have a credit card he/she feels he/she is not worth enough. Next we moved to the other building that housed less expensive items- fans, water filters, coolers, induction cookers and so on. The Great Warehouse sale by Viveks is ON for public till tomorrow. On Monday, 28th it will be open for B2B customers. I asked if it will be worth buying the extended warranty- quick answer was Yes. Asked if they plan to run this kind of sale frequently, answer was that they can't afford to do this more than once an year. On being asked about Metro Cash and Carry, Srinivasan said it might work out for small shop owner who buys say 10-20 fans, but doesn't work out for him as he can buy 1000s of fans directly from manufacturer. I asked if Viveks showrooms are franchisees- Srinivasan told that most stores are COCO- Company Owned and Company Operated. They do get inquiries from prospects for franchisee model, but that is not immediate focus for the company. With their proven track record, assets and revenues, Viveks can easily raise several millions and expand its network with hundreds of outlets, but management is not looking for such aggressive growth. They would grow but in slow and steady way, without compromising on profitability and quality of service. Best wishes to Viveks for their long term success. Free delivery is usually only for high value/large size goods like AC, Refrigerator, Washing Machine etc. If you are planning buy medium size items like water purifier, small size TVs and other goods, you should be able to arrange your own transportation (will be difficult to carry them on two wheeler- car will be required), else a delivery charge may apply. Discounts range from few rupees to as high as 50% for some select brands/items. That panaroma pic of washing machines is nice. I was not able to get all the washing machines in a single shot, wonder why I didn't think of this! That's a lot of effort and recollection of information. Nice post.